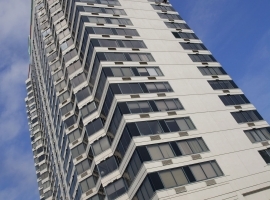 MPG is a specialist firm in high-rise exterior façade maintenance and repair. 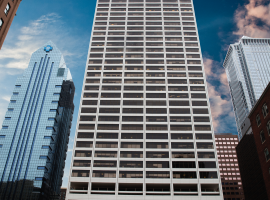 The tall buildings that make up the downtown areas and skylines of our region’s urban centers are often challenging to access, and logistics can be extremely difficult. These projects require a knowledgeable approach from experienced professionals. 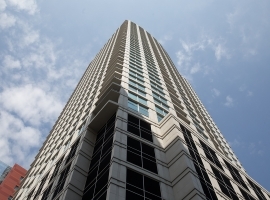 MPG’s management staff works closely with engineers as well as the building’s owners and property managers to develop solutions that accomplish the work while accommodating the use of occupants and public safety. These exciting projects bring the talents of our highly skilled and trained workers to impressive elevations above the busy streets and sidewalks below, some exceeding 500 feet. 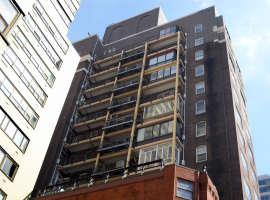 Many of MPG’s high-rise façade projects involve masonry restoration work and flashing repairs in addition to comprehensive exterior envelope maintenance campaigns including complete replacement of the exterior joint sealants as well as façade coatings and waterproofing. Extensive concrete repairs are often required at exposed structures such as columns, spandrel beams and balconies. Balcony deck coatings and railing repairs are also a common component of these projects.